To quickly save webpages to read later, add them to your Reading List. To read pages in your Reading List even when you’re not connected to the Internet, you can save them offline. Add a page to your Reading List: Move the pointer over the Smart Search field, then click the One-Step Add button that appears at the left end of the field.s. You can also Shift-click a link on a webpage to quickly add the linked page. Show or hide your Reading List: Click the Sidebar button in the toolbar, then click the Reading List button at the top of the sidebar. To hide the list, click the Sidebar button again. Save a page in your Reading List to read when you’re not connected to the Internet: Control-click the page summary in the sidebar, then choose Save Offline. You can also swipe left over the page summary, then click Save Offline. Remove a page from your Reading List: Control-click the page summary in the sidebar, then choose Remove Item. You can also swipe left over the page summary, then click Remove. Or, swipe all the way to the left until the page summary disappears. Search your Reading List: Enter text in the search field above the list of page summaries. You may have to scroll up to see the search field. 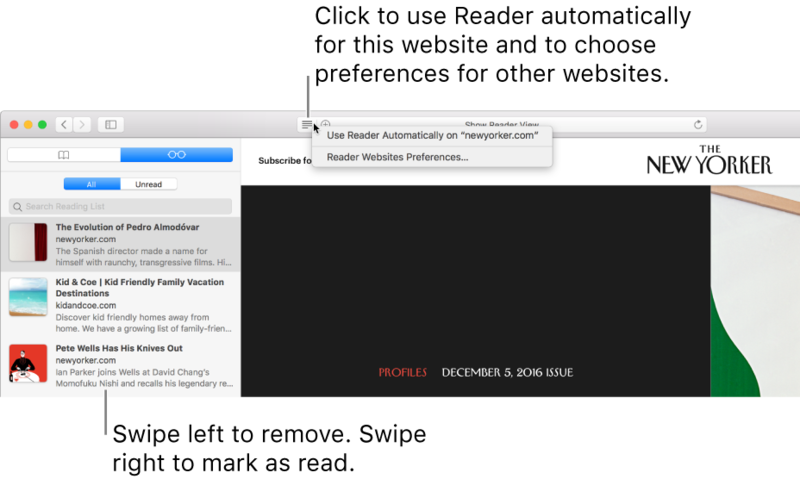 Read the next page in your list: Keep scrolling when you reach the end of a Reading List page—no need to click the next page summary in the sidebar. Hide pages you’ve read: Click the Unread button above the list of page summaries. Click the All button to show pages you’ve read in your list. You may have to scroll up to see the buttons. Mark a page as read or unread: Control-click the page summary in the sidebar, then choose Mark as Read or Mark as Unread. Note: Safari uses iCloud to keep your Reading List the same on all your Mac computers and iOS devices that have Safari turned on in iCloud preferences. With iCloud, your Reading List and bookmarks are archived automatically, and you can restore them from an earlier version at any time.